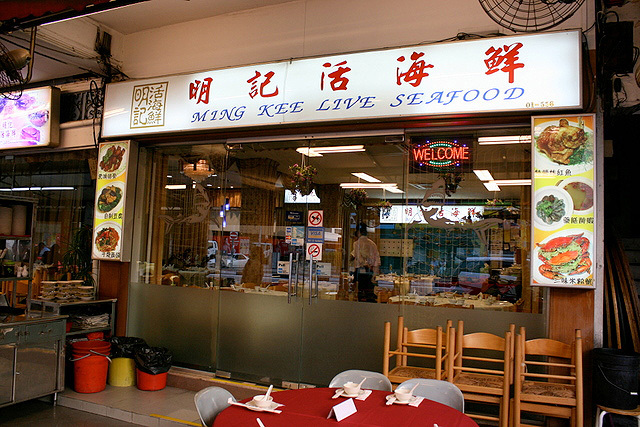 We had an impromptu foodies dinner at Ming Kee Live Seafood. Nic+XLB, Keropokman+ sister+Momo, Aromacookery+hubby, and 陈先生 who made reservations, and by power of mighty surname alone managed to get us the "royalty" table! Even some "Datuk" next to us had to settle for a lesser table! Well at least we know everyone is treated equal there. OK, onto the food! 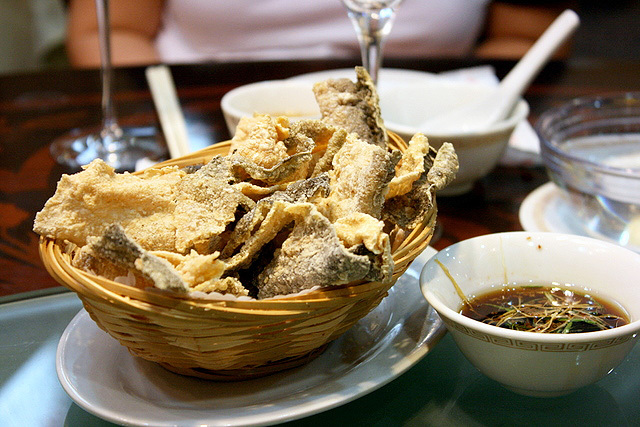 Fried eel skin with a warm and savoury soy-based dip - a must-have appetiser! This was so crinkaliciously addictive! Light as air, with little sign of grease. Yes, food is best when shared with friends, but sometimes you just want the whole basket to yourself! Flower clams ("hua la-la"?) doused with fragrantly and perfectly fried minced garlic - these folks really know how to control their fire and not burn the garlic. I also love that soy-based sauce that this place does so well. This is simply too good! They have various clams, mussels, etc that they can also do this way. 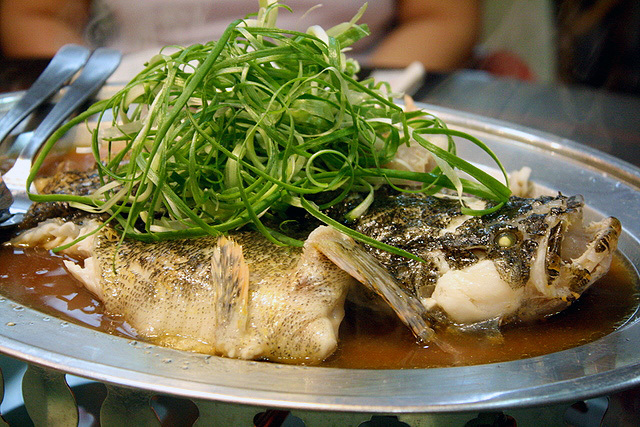 Steamed Soon Hock or Marble Goby. You can tell this is really fresh and there is no muddy taste at all. So tender, so sweet. You'll want to finish every sliver available! Bamboo Clams with buttery garlic. These were S$10 each, but that's a steal because of the freshness and the way they are so expertly done. The texture is soft yet crunchy. Don't worry - the garlic may look overwhelming but they taste divine. Their spicy bite is somehow neutralised by the hot butter, and fragrant soy-based sauce. 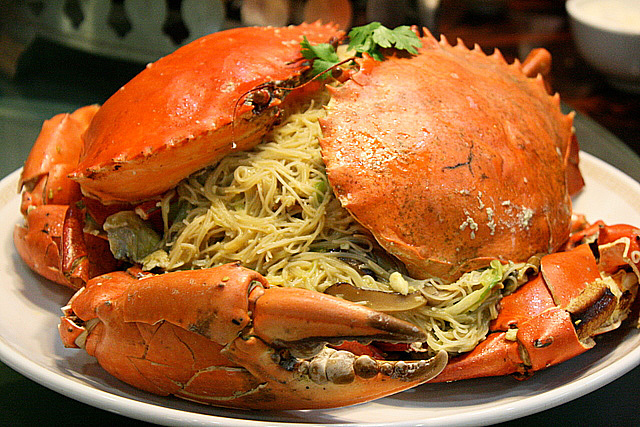 This is what we came for - the signature Crab Beehoon! Everyone at the table loved this. The vermicelli is well-braised and flavourful, but also very soft (good for people who like it that way). Still, I was slightly underwhelmed but could not immediately identify why, until it suddenly hit me - these noodles are coated with crab roe! Wait, isn't that a plus point? Well, yes if you like crab roe. Not my favourite thing. Guess this means I finally give Sin Huat a miss too, since his are also done the same way. But I can tell you the huge crabs were tasty beyond description. Their natural sweetness came through so well! I must come back for the chili crab and butter crab. We were all very glad we did not have to wrestle these crabs while they were alive. Look at those man-sized pincers! 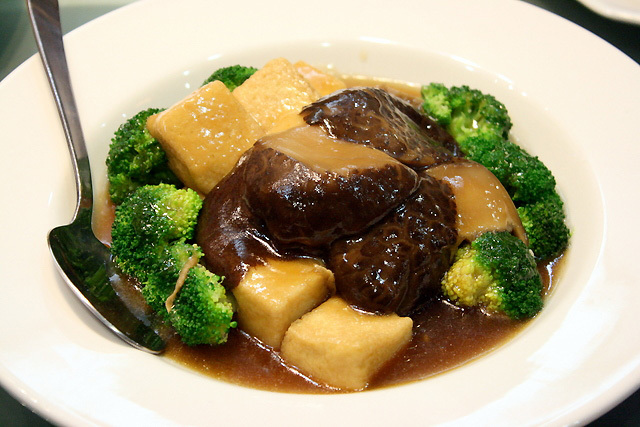 Their homemade tofu is silky soft with robust soybean flavour, but on the whole the dish was rather bland. The chefs here are not heavy-handed with sauces and flavouring, but that's a good thing. Guinness pork ribs - this dish enjoyed a duet with smoked duck (see background). Pretty good. I'd like to say it was a nice change from the seafood but no, I can happily keep eating more seafood. It's just so good! Smoked duck that tasted like expensive ham - this is an amazing feat! 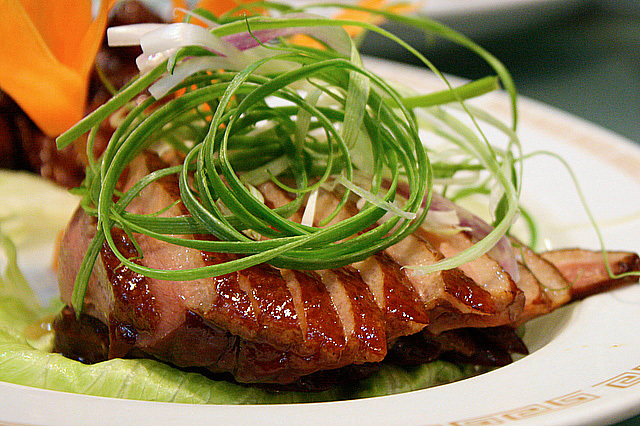 I never knew duck could become this texture or taste! 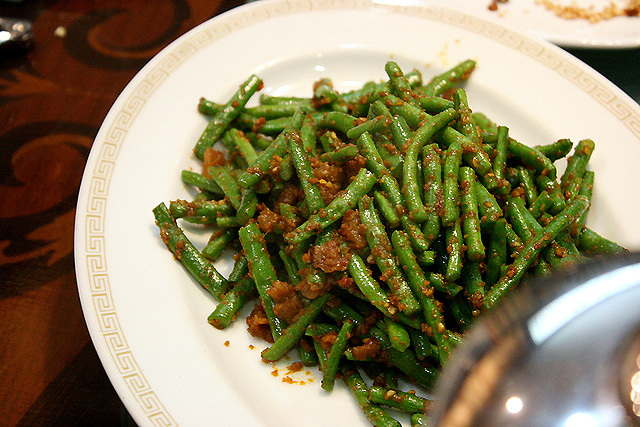 Four season beans in sambal. By the time this arrived, we were very full. But I still enjoyed this. The sambal has kick! No matter how full we are, there's always room for dessert. Two, in fact! 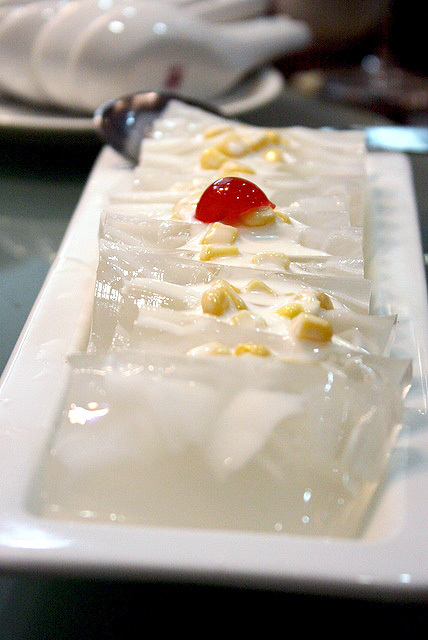 Firstly, coconut jelly - light, refreshing, gently sweet with real pieces of young coconut flesh. 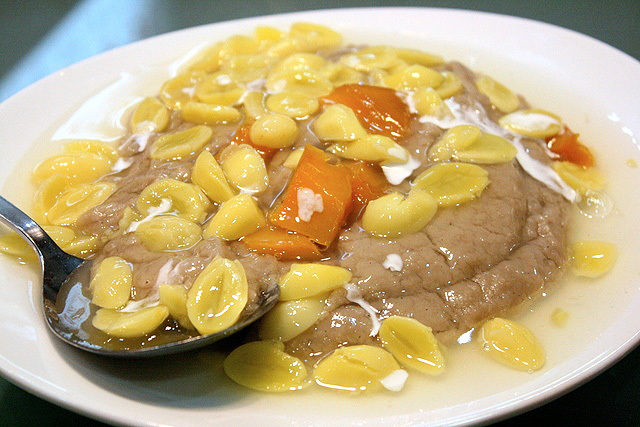 Yam paste (ornee) with gingko nuts and sweet potato. The yam's texture was very smooth and soft. The whole thing is not overly sweet. So ended our phenomenally delicious dinner. Service was discreet and brisk - they kept changing dirty plates and anticipated our needs just by observation. No corkage charges and yet they provided good wine glasses. Bill was about S$488 for 9 persons (or S$54 each). Slightly more than what we usually spend on a meal, but we did have a feast! Ming Kee can be quite easy to miss, as it's a small frontage hidden by its own awnings over the al fresco area. Check out Aromacookery's, and Keropokman's coverage of the dinner here - part 1 and part 2. YES oh yes, we so want to go back again!!! Come lah, those who missed out! 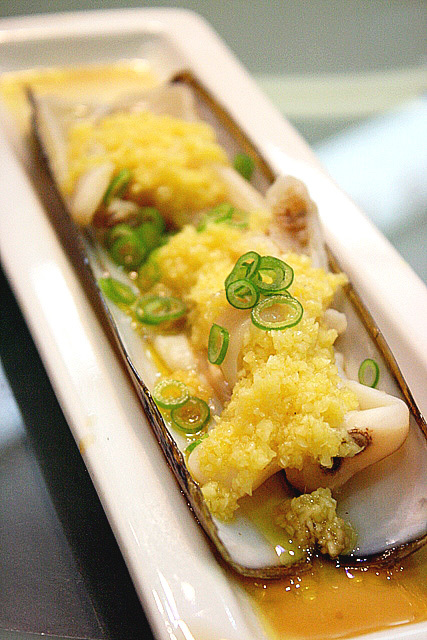 Bamboo clam is a must, and so is crab, lala, fish, dang...almost everything! This is why I love Singapore food blogs... this place looks unbelievable! And I never would have found it on my own. That crab looks amazing but the pick of the dishes for me would have to be the fried eel skin - it looks so interesting! I've never tried eel before but it does look good! Fantastic memories of a fantastic meal! 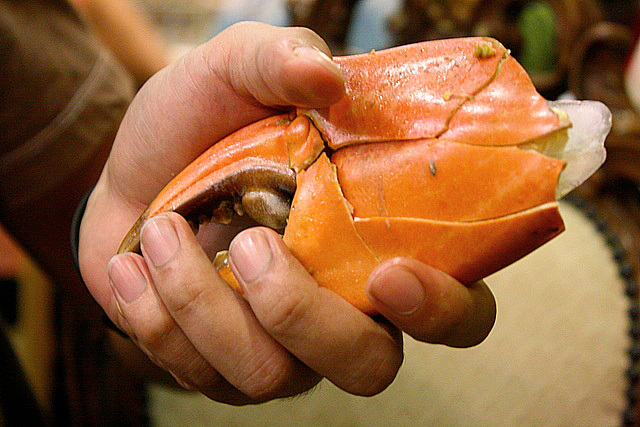 PS: Love the pic of the gigantic pincer against my hand. Feel so strong and weak at the same time. Hehehe. Ernst: thank you! I would never have known about this place either, if not for the Makansutra forum folks. 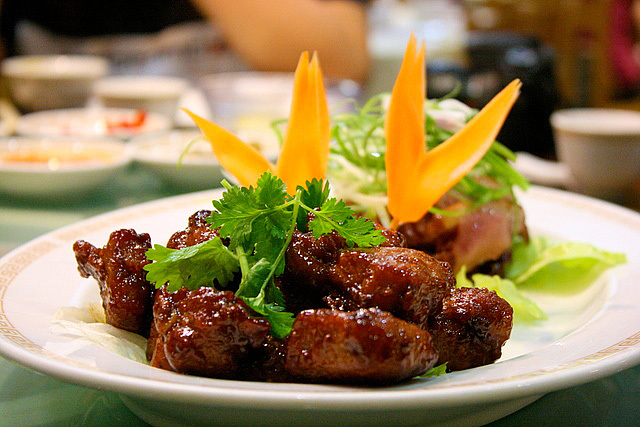 LIC: Sweet-sour pork your favorite mah! Budget? Then just eat the $10 clam lah. And lots of rice! Really very worth the experience! Nic: Yes, the ladyboss rattled off a lot of stuff I couldn't catch. LET'S GO AGAIN!!! Katie: The fried eel skin simply the most delicate and delicious cracker you'll ever try! Oh, my hubby and I were wondering where to bring our parents for dinner until I visit your blog! We so want to try the seafood! This is not the place Bourdain visited with Szeto? The eel skin looks pretty addictive alright. I've only tried salmon skin, and I couldn't stop popping them! k10: yes, I think your parents will be pleased! GFAD: Nope, Bourdain went to "Sin Huat" with Seetoh. LFB: Kenny yes, this is the one you missed! Never mind, we're planning round 2! Let us know when you'll be in town - maybe we'll schedule it then! OMG!!!! looking at these pics in class now and drooling away!!! do they have pumpkin prawns on the menu? 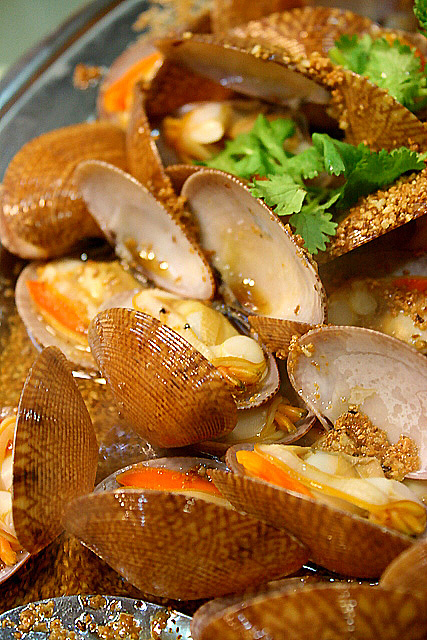 the bamboo clams look delish! Pumpkin prawns? We didn't ask. Like in many old school Chinese restaurants, they didn't give us a menu, but simply rattled off their suggested dishes. Can call them to ask, I'm sure. yummy... try this seafood now. Just had this yesterday after checking out your mouth-watering photos! Would have never ventured to Macpherson if the boyf didn't point this out. The fried eel skin was so good, especially with the sauce! We were on a "budget" so opted for the crab and soon hock over the bamboo clams. The lady boss recommended scallops to us and it was so good! The serving of scallop in its individual shell with garlic stir-fried in butter was to-die-for, and all for only $25! Quite disappointed with the crab though, not juicy or sweet. Most of my friends liked the or-nee because it wasn't too sweet but I like mine sweeter, and my fave is from Chin Lee Restaurant in Bedok North, good chi zar & affordable! Coffee ribs are a must-try! I was there this evening with my wife and daughter. I went there once and this is my second visit. We ordered 3 dishes which is steam mussel, chilli crab and steam fish. The issue is that the steam fish has flesh like rubber instead of being silky soft and smooth. I asked the manageress if the fish is frozen, considering that it costs S$40, or live?? She started telling me of fish from fresh water compared to fish from th e sea is different blah blah blah... All rubbish. This is not the first time I'm eating live fish and also I've eaten frozen fish before. I can tell the difference. I find that either this restaurant is dishonest or that their quality is bad ot that they can't cook fish well. wow that's hell of a seafood dinner. I wish live in Asia. Great pictures all around. Ming Kee has moved to a spanking new premise at 520 Macpherson Road. The owner Ivan will be doing the cooking himself for now. Don’t miss his marvellous cooking! Call 67445520 for reservations today. Do not ask me why there are two restaurants on the same street - it baffles me totally. It was painful finding parking here during dinner time. At least the 556 one was near to the HDB open-air carpark. I dined here with my family last December 2013 and it has taken me sometime to decide to write a review because I felt that this has really wrong. This restaurant has a window at the front of the kitchen where diners could look into. Was utterly disgusted when I witnessed the chef cooking and smoking at the same time in the kitchen. Is this allowed? How clean will the food be? The chef was also drinking whisky at the same time. Food was over-rated, especially the signature crab bee-hoon which tasted like it had been cooked with seawater. The Guinness Stout pork ribs were chunky and difficult to bite, especially for older folks. Service was horrible...there was only one waitress to service 4 tables who was also the order taker and cashier. We had to DIY to get our own tea pot refilled at a pantry at the back of the restaurant and our bill took the waitress close to 20mins to process??? My final bill for 4 persons was $363 which included a service charge of 10%???!!!! I suspect that I have been ripped off here. This is because like most Singaporeans, my family enjoys eating crabs and we have cooked our own Sri Lankan crabs at home before. We buy the big ones from the Tekka market for $37/kg and Ming Kee serves at $50/kg which is considered value as most major restaurants charge more than $60/kg. The supplier had told us that normally the big Sri Lankan crabs are available in 1kg/1.2kg sizes only. What really bewildered me was that the crab that was served to us was the most 1.2kg however my receipt showed that I was billed for 1.7kg which was like 500g heavier or rather $25 more, not to forget the 10% service charge that was imposed on the total bill????? We did have a word with the chef Ivan (the one whom I witnessed smoking) who gave excuses and said that he was not the boss and couldn't make decisions. We were sick at the attitude shown to us and just wanted to get out ASAP. To sum up, as food-loving Singaporeans sometimes we can overlook being "carrot-heads" when we eat out if it has been a fair dining experience, especially if the food and service is good, but this????? I think this has gone really overboard. These people should be put out of business. Hi James, thanks for sharing with such detail. I hear the 520 Macpherson one (opened by the son separately from the 556 outlet) has recently closed. I have never been there myself. Ben & Jerry Chunk Fest 2009 Supports Local Music!